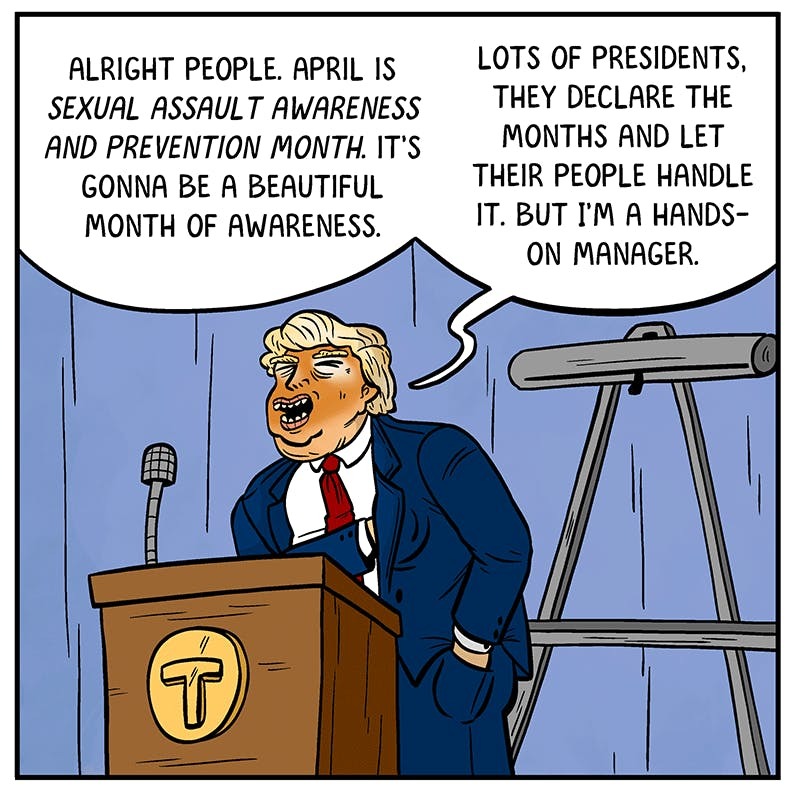 Trump announces “National Sexual Assault Awareness and Prevention Month” April Fools? It’s almost as if President Dickwad is using himself as the motivator so we can be aware of the magnitude of this problem. I wonder how the women he’s already assaulted feel about having their own special month. And befitting this social media president … he announced his proclamation via Twitter. Whoa! Did any of the White House Bozos read this f**king statement before they released it? It’s clear the Head Bozo didn’t! Who told our Predator-in-Chief this was a good idea? Hope Hicks is gone. Melania’s not speaking to him. Ivanka’s pissed because he compares her to the women on his sexual assaultee list. He’s got no wife beaters left in the West Wing. But he’s let it be known he wants Rob Porter to boomerang back. The Seriously Absurd’s crack staff learned that the idea for this “special month” was solely another of the “no-brain-impulse-moves” from 45 himself. He knows the best way to clear his name is to spend a month publically tweeting and holding Fake News announcements about Infrastructure Week, or North Korea, or that Beezos guy who’s younger and richer than he is. Bring back Omarosa … please. Michael Avenatti reportedly spit coffee across Wolf Blitzer’s interview table discussing this latest sexcapapade. But here’s the Real News … in 2009 President Obama was the first president to proclaim April as National Sexual Assault Awareness and Prevention Month. Aha … the supreme motivator for Trump! It’s to trump President Obama … no matter how stupid he looks doing it! Sad! Look at the bright side, Ricky Ricardo! Maybe next month will be “Let’s Hit China Where It Hurts” month with huge new tariffs on trivial little things we buy from them like insulin, epinephrine and the raw materials used to make roughly 8,000 other commonly used pharmaceuticals and well as manufactured medical items including pacemakers, implantable orthopedic devices such as artificial hip & knee replacements…WHAT COULD GO WRONG WITH THAT?